The Cliffs of the Neuse display the effects of the forces of erosion that have carved and chiseled cliffs in the south banks of the Neuse River. Extending for 600 yards, this series of cliffs rises 90 feet above the water. Layers of sand, clay, seashells, shale and gravel form the multicolored cliff face, a rainbow of white, tan, yellow and brown. The cliffs were formed when a fault in the earth's crust shifted millions of years ago. The Neuse River followed this fault line and, over time, cut its course through layers of sediment deposited by shallow seas that had earlier covered the coastal plain. A portion of the river took a bend against its bank and the water's erosive action slowly carved Cliffs of the Neuse. Much of the human history of the area centers around the river. The Tuscarora and Saponi Indian tribes once occupied much of the land between the Neuse and Pamlico rivers. What is now the park used to be a ceremonial ground and a gathering place for hunting expeditions; the river was used for travel into the surrounding wilderness. Early European settlers set up a trading center at Whitehall (now Seven Springs), the earliest English settlement in the area. After the Revolutionary War, a stagecoach line and river traffic promoted growth of the town. A gateway to the Pamlico Sound and the Atlantic Ocean, the Neuse River also played a role in Civil War history. As part of an effort by the Confederate navy to challenge Union control of North Carolina's coastal waters, an ironclad ramming vessel, the CSS Neuse, was built at Whitehall. The ill-fated ship ran aground in the river and was destroyed to prevent its capture. The town itself was bombarded by Union cannons and much of it was demolished. Early in the 20th century, Whitehall was known for its mineral water cures. In an area of just a few square feet were seven springs, each said to produce water with a different chemical content. On summer weekends, visitors checked into local hotels to drink mineral water and to take riverboat excursions to the cliffs. A gallon of the water per day was prescribed for "whatever ails you." The waters were also used for whiskey stills—locals explained that if the mineral water didn't cure people's ills, the corn whiskey would make them forget what ailed them to begin with. In the 1920s, the community was damaged by fire and never fully recovered. 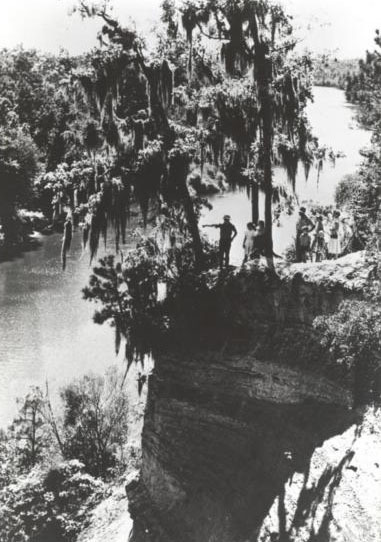 In 1944, local landowner Lionel Weil proposed that the cliffs area along the Neuse River be preserved as a state park. Land on the south side of the river was donated by Weil and other individuals through the Wayne Foundation and the park was established in 1945. An additional contribution of approximately 200 acres extended the boundary east of the river. Additional purchases and donations increased the park to its present size of 892 acres. A range of habitats contributes to the abundance and variety of flora in the park. River margins, flood plains, rolling uplands and ravines are home to an unusual mixture of trees, shrubs and herbaceous plants. More than 420 species of plants have been recorded here. Pine forest areas in the park are similar to those in the Sandhills while oak and hikory forest areas are more closely related to the Piedmont. Areas of cypress swamp display cypress and live oaks, and are characteristic of the coastal plain. Other areas displaying galax, red oaks and Virginia pines are more typical of mountain habitats farther west. The presence of Spanish moss also demonstrates the biological diversity of the park. Though common in the eastern parts of the state, Spanish moss reaches the western limits of its distribution at Cliffs of the Neuse. Draped in clusters from the limbs of cypress, oaks and other trees, it grows in moist areas along the river and creeks. Not really a moss but a rootless flowering plant in the pineapple family, Spanish moss obtains nutrients directly from the air. Like the plant communities, animal life in the park is abundant and diverse. Observe opossums, raccoons, foxes and squirrels in the campground and along hiking trails. River otter and muskrat swim along the waterways. Reptiles and amphibians are also found in wetland areas. Most of the snakes are nonvenomous. However, copperheads are present. Small nocturnal rodents and timid white-tailed deer are also in residence but are discrete and seldom seen. Birds are an easy study in the park during any season and in any habitat. The northern parula nests in clumps of Spanish moss while the prothonotary warbler lives along the river. Fall and winter bring a host of migratory waterfowl to the area to join the native wood duck. North Carolina Division of Parks and Recreation. Cliffs of the Neuse State Park. http://www.ncparks.gov/Visit/parks/clne/main.php (accessed September 1, 2015). "The Way They Were." Photograph. [before 1964.] N.C. Division of Parks and Recreation Photos. http://www.dpr.ncparks.gov/photos/forPublic.php?pid=5832 (accessed September 2, 2015).